Despite strong evidence in current marketing theory and practice that a differentiated marketing approach increases recruitment success, blood services worldwide often use undifferentiated marketing strategies to address new blood donors. Relying on the assumption that differentiated marketing is highly promising; the authors developed an online experiment among 838 participants who had not donated blood during the past 10 years. The experiment tested the effects of a differentiated in comparison to an undifferentiated marketing campaign on three marketing outcomes: (1) awareness, (2) intention, and (3) behavioral enactment. 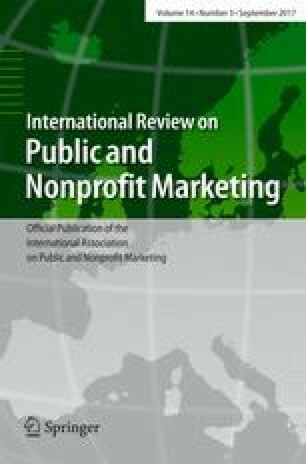 Surprisingly and in contrast with most marketing studies in the for-profit context, the results of the blood donation experiment suggest that differentiated marketing is not more effective than undifferentiated marketing. This finding has important implications for marketing strategies and actions of blood services. The authors would like to thank the German Red Cross Blood Services North-East for their support in developing the marketing campaigns and for their valuable feedback during the study. Kurverwaltung Bad Füssing (2015). http://www.bad-fuessing.de. Accessed 19 Nov 2015. Socio-economic Panel (SOEP) (2011). Data for years 1984–2010. doi: 10.5684/soep.v27. ThreeSpeech.com (2008). http://threespeech.com. Accessed 30 Apr 2014.